And that, my friends, is the Coexist Bumper Sticker philosophy in a nutshell. I don't get your point. 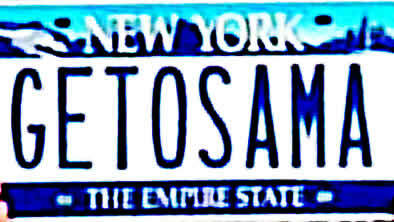 Of course you can't have a "Get Osama" plate. Think of the poor kids named "Osama" or other individuals who might be named O. Sama. What's your point with the Coexist sticker? Is it a bad thing? Is it blasphemy to ask people to leave peacefully? Are you saying that Bush isn't capable of catching Osama? That he doesn't want to get him because he makes a more effective bogeyman when he's loose? Double treason! You FDR-loving, terrorist-coddling liberal! BTW, I think your bumpersticker is far more interesting, provocative and insightful than Fraley's. I think the PhotoShopping is better on mine, though. I'd like to see an honest coexist bumper sticker, one that showed the crescent at the beginning devouring all the others. Or perhaps holding an AK-47 and all the other symbols full of bullet holes. By that logic, FDR was a failure because he died before Hitler. Nice try, though. I am sure I am not the first patriot to suggest that it is improper if not treasonous to order a license plate that ridicules our Commander-in-Chief in any way, such as pointing out that Osama remains at large.